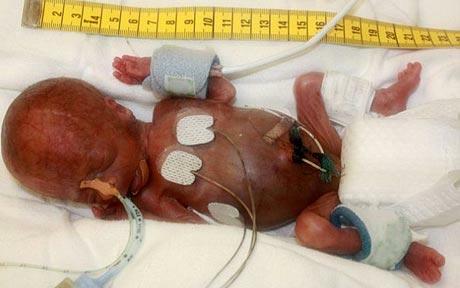 German doctors have revealed photographs of the smallest premature baby boy to have survived against incredible odds after being born at 25 weeks weighing just over half a pound. The baby, only known as “Tom Thumb” weighed a fraction over 9.7 ounces (275 grams) when he was born by Caesarean section 15 weeks prematurely at the University of Medicine at Göttingen in western Germany in June 2009. Like most babies born at this gestation, he need 24 hours monitoring and was hooked up to feeding tubes, breathing tubes, a heart monitor, a catheter and a plethora of electronic devices to monitor every vital sign as he faced risks of cerebral hemorrhage or organ failure. In December, the baby was finally pronounced “stable” after achieving a weight of 8.2lbs – considered an average birth weight in Germany. Even though officials from the hospital said that, they have checked all available records of premature births worldwide, they were unable to find a viable birth of a boy at a lower weight, we covered a tiny baby last year who weighing 259gms. Weighing just 1 ounce more, Amillia Taylor is still believed to have been the youngest surviving micro-preemie arriving at 21 weeks 6 days weighing 10ozs in Miami Florida.